SIGNIFICANT progress has been made on preparations for the 2014/2015 summer cropping season with most farmers having completed land preparation. Some have commenced planting crops that include maize, soya bean and tobacco. The cropping season started on September 1 and the country expects to produce 2,2 million tonnes of maize. 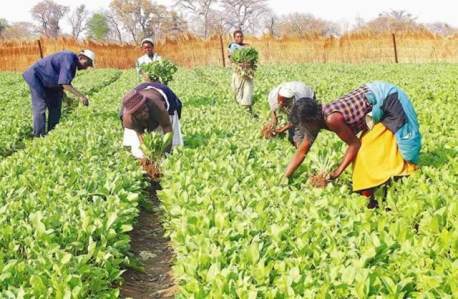 In a survey conducted by The Patriot this week in Mashonaland Central and West provinces, most farmers were confident that the summer cropping season would produce a bumper harvest. Most farmers in the provinces have finished land preparation for maize and soya beans with the bulk of tobacco producers having already finished planting the crop. The province has some of the highest output in tobacco, grains and dairy production. The majority of farmers in the areas have each set aside at least five hectares for maize production as they seek to boost food security in the country. A successful maize producer in Concession Josiah Chikowore said he has managed to raise capital to fund half of his maize and soya bean production. “Accessing inputs has been a major challenge in the effort to boost production,” he said. Chikowore said he had managed to raise capital to finance production and inputs from local organisations. He said he had already planted 10 hectares of maize under irrigation while land preparation for soya beans had been completed. “The maize I planted under irrigation has begun to germinate. “I expect that when the rains start to fall they will complement the irrigation and ensure that the maize has adequate water supply,” he said. Chikowore expects to have put 10 hectares under soya beans by mid-November. A farmer from Concession who has also finished planting tobacco Willard Manyame said the crop was growing well under irrigation. Manyame said he had managed to start work supported by contract farming. “I have managed to successfully plant two hectares of the golden leaf which is doing well,” Manyame said. Apart from tobacco he secured inputs under a loan facility to produce at least four hectares of maize. The agricultural industry requires at least US$2,5 billion to guarantee a successful 2014/20-15 season. Presenting the 2014 Mid-Year Fiscal Policy Review Statement, Finance Minister Patrick Chinamasa said communal and A1 households would be given 50kg of Compound D and 50kg of ammonium nitrate (AN) fertiliser. In addition, the farmers will get 50kg of lime and 10kg maize seed from the funds being mobilised by government. A soya bean and maize farmer in Raffingora Phillip Gambiza said he had finished land preparation and acquired inputs. He however, said planting would commence when rains begin to fall. “All is now in place I am only waiting for the rains to start planting,” he said. “I am glad that this year there has been an increase in the number of loans from local financiers to assist us in boosting our production. Patricia Tagwirei, a maize farmer in Banket, who has planted more than 12 hectares of maize, said she hoped for good rains to ensure that her crop was not affected by dry spells. “Last year I lost most of my crops due to late ploughing emanating from late acquisition of inputs. “At least this year I managed to acquire my inputs early and only the rainfall may hinder output,” he said. Farmers’ unions have indicated that to achieve the 2,2 million tonnes on two million hectares, Government must start moving the US$184,8 million worth of inputs to the 1,6 million communal, resettled, small-scale and A1 households. Government said it would not finance the A2 farmers who must approach financial institutions for support. Rainfall is the major determinant of the agricultural production patterns in Zimbabwe. Most crops are planted in November/December at the beginning of the rains and harvested between April and June.